The Ten current releases, sheets no 30011 - 30020 continues the growing line of products from Wingnut Wings, The new set #30018 give us a wider choice of subjects to portray than what is in their #32015 kit. Given the numberings of the current sheets, we can probably expect more releases of this line of products. A guess is that some of these will be for the coming Fokker D.VII that also offers a wide range of about 70 of colourful profiles. The priced at $19.00 for each set and the Wing nut Wings current international free shipping policy also applies to these. For this scale we see that this is not as high as some sets. As has been discussed here previously this possibly reflects the cost of what these sheets cost to produce. Depicts Albatros D.Va machines from various Jastas. And is the second sheet that is dedicated to various machines from different Jagdstaffels that have the factory varnished fuselages and includes five known profiles. A - Albatros D.Va 5815/17, Ltn. Gerhard Hubrich, Marine Feld Jasta IV, late1918. His personal insignia is a chick hatching from its egg. Though this is a wooden wonders sheet this machine has the typical Marine Feld Jasta mottled camouflage on the fuselage. It was part of a batch of 250 D.Va aircraft ordered in September 1917 (serials D.5600 - 5849/17). He survived the war with 12 victories and as a Major supposedly scored a further 2 in the next world war. B - Albatros D.Va 7098/17, Oblt. Rudno –Rudzinski, Jasta 17, early 1918. 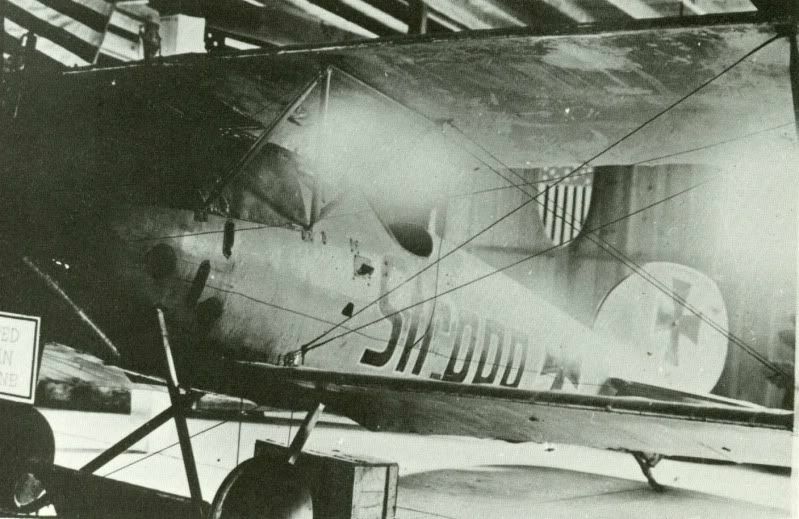 His stylized personal marking is the name “Gisi” on the fuselage. This was used on one other previous Alb. D.V type in a different format. Except for the personal & Jasta markings the machine appears over all “factory fresh”. C - Albatros D.Va 7343/17, Ltn. Kurt Jentsch, Jasta 61, June – August 1918. His personal marking is a stylized five pointed star. After the war he wrote an autobiography titled "Jagdflieger im Feuer". Much of his book compares the flight characteristics of German aircraft (Albatros D.) types to the Sopwith F.1 and Spad XIII. He also wrote “Beim Jagdflug Todlich Verungluckt”. D - Albatros D.Va 6981/17, Pilot Unknown, mid- late 1918. This stylized marking is a red number “3”. According to WNW description and photos the machine has had its Spandau Maxim machine guns removed and also its pilot’s right side wheel covers are missing. I see a two toned pennant hanging from the trailing edge of the lower wing. It crosses over the port side wheel cover. This machine may have been the lead machine used in getting the 2 seater aircraft to assemble in flight formation over the airfield before setting out to the front. The lack of armament makes sense under this guise. The 2 toned pennant would differentiate this machine from any other Albatros fighters winging through the area during the formation assembly. The attachment(s) would be at the trailing end of the wing rib. E - Albatros D.Va 7161/17, was flown by Vzfw. Gürgenz of Jasta 46w (Wurttemberg unit) and brought down on 3 April 1918. But in this package they seem to be focusing on the post war NASM restoration version. The following are notes on the condition of that restored version. 1. The circular access door on the pilot’s left forward nose area of the fuselage (the larger of the two on that side) seems to be placed somewhat forward of its typical location as seen in other Albatros D.Va types. The restored Stropp has this access door several inches closer to the propeller. 2. According to John White of the AWM the Smithsonian painted the cowlings green based on the incorrect attempt on first Australian restoration of Alb. D.Va 5390/17. 3. The "R.F." that shows up on the forward fuselage on some decals and art are from the late war bond drive RF = (in English) Republic of France. 4. The Teves und Braun radiator was not left in bare metal on the restoration, it was sprayed with aluminum paint. The originals were double dipped in liquid solder. 5. The weights serial that is painted on the restored airframe seems to be non-standard or incorrectly painted. Notice there is no horizontal line above the total weight. There is only a "k" and not "kg." after the total weight. Regarding the stencil Gesamtgew vs Gesammtgew, photographic evidence suggests that Gesamtgew is only found on OAW built D.Va airframes while Gesammtgew appears on Johannisthal built D.V (3 line weight tables only of course) and D.Va airframes. The differences are reflected in decals #22 and #63 on this decal sheet (but not on Mr. Bar's beautiful profiles). Just to be fair, there could be exceptions to this 'rule'. 6. Albatros logo is notably backward on the restoration. Was this a mistake or could the rudder have been taken from another plane like the wing panels? It's common for OAW planes have the backward logo. 7. The correct Jasta marking for this plane would have included a yellow spinner and wheel covers (as seen in WNW kit #32015 profile). The restoration looks like the green tail stripes may have been painted the same color as the dark green metalwork mentioned in comment #2 here. 8. The Camouflage of this plane had traces of green/lilac paint on the tail fabric which means that it should also have those colors on the wing. But replacement lozenge covered wings were derived from captured examples in French storage stocks for the bond tour. 9. The restoration is missing the two manufacturer plates for the nose areas. It seems like this plane would had these when it was delivered. Possibly the relocation of the access port prevented this? The rigging datum line is also missing. The decal sheets came “Zip-Loc” sealed in A4 sized plastic zip locked bag, making it easy to reseal, and keep the decals safe until you use them. A folded A4 sheet printed in full colour serves as a four page booklet that gives you the instructions on application and also the bio of the pilots that flew the planes. The style of the monograph is similar to what we have seen in the instruction booklets from the kits. Full colour profiles are done by Ronny Bar and they are complimented by archival images of the subjects. One fine detail in the instructions hints as to which optional parts to use from the kit and which engine option to choose. The decals are of the same quality and style of what we have gotten used to from their kits. Cleanly and crisply printed by Cartograf of Italy, my samples were in perfect register with a glossy sheen and clean opaque colours. Small decals such as the prop, weight tables and rigging instructions are also included on these sheets. Some of the Iron crosses tend to duplicate what is already in the basic kit. Lozenge or no lozenge is no longer a question! But notably every WNW sheet includes profiles that have standard two tone uppersurface camouflage painted wings, and does not need lozenge to be finished. The instructions for the Albatros sheets do state that the lozenge decals are available separately. Decals # 30001 (5 colour upper), #30002 (5 colour lower) and 30005 (rib tapes). So if you fancy doing one of the lozenge covered profiles, you either have to purchase them separately or look at what other aftermarket manufacturers may have and purchase them separately as well. The conclusion is we are in the golden age of WWI aviation modeling subjects. My suggestion is to get what you can, while you can. You never know what the future will bring. Model On! A very special thanks to Dave Douglass for allowing me to use his research & artwork concerning D.7161/17 "Stropp" for this review! Here are some comments from the author and writer Greg VanWyngarden. 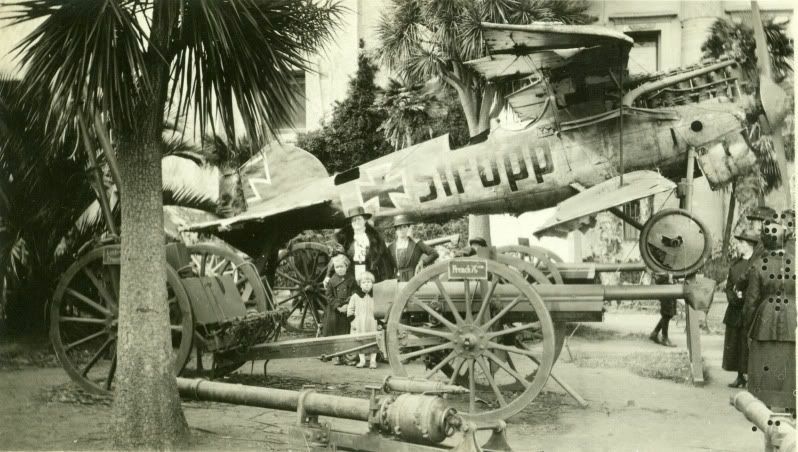 "The supposition is that "STROPP" was flown by Unteroffizier Erich Gürgenz, who was wounded and shot down on 3 April 1918 and died the following day. Gürgenz was born on 10 September 1885 in Berlin and joined Jagdstaffel 46 on 10 February 1918. He made his sole victory claim on 12 March with an SE 5a. It has been claimed that his victor was Adjutant Paul Petit of Escadrille SPA 154. However, there's no absolute proof that Gürgenz was the pilot of STROPP. It is, though, a reasonable hypothesis." GVW continues. "For those who don't have access to them, here are some of the descriptions and stories about "STROPP" that Stephen and others have referenced: In “Cross & Cockade” (US) Volume 4, No. 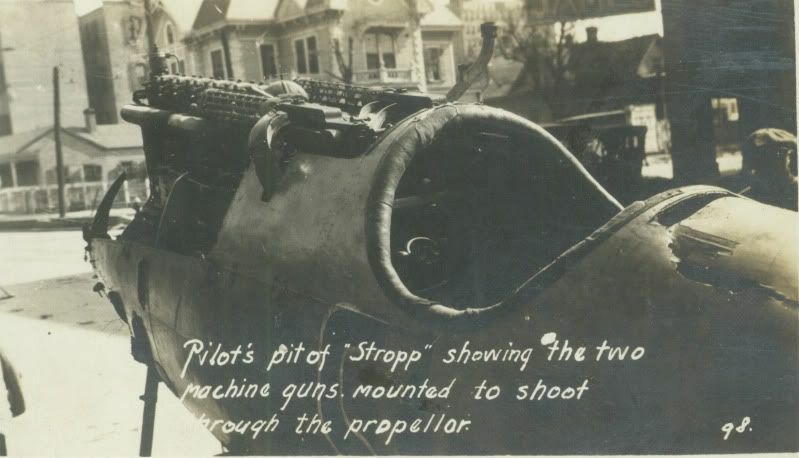 2, 1093, renowned aviation historian Peter M. Bowers wrote an article on STROPP. Here are the relevant passages: “I had made extensive notes on this machine during the 1930’s, including tracings and dimensions of the insignia (thanks to my Grandmother being a good friend of the director, which made it possible to visit after hours, set up ladders, etc.) Unfortunately, all these notes were lost when my home was burned in 1939, so all I’m going on is an enthusiast’s memory of some twenty-five years. “I first saw the ship, hanging up in the “War Room” (of the DeYoung Museum) in 1930, but I didn’t know what it was at the time. In those days the old Flying Aces magazine was coming out with a two-page spread of very simple line sketches and brief descriptions of WWI ships by C.B. Colby. When the Halberstadt CL.II appeared in this series, I thought that’s what the Museum ship was because of a cut-out behind the pilot’s cockpit that made it look like a two-seater. Such obvious differences as a round fuselage for an Albatros versus a flat-sider for a Halberstadt (not too evident from the Flying Aces drawing) didn’t sink into a 12-year-old mind. Detailed identification was further complicated by the fact that the rudder and ailerons were not installed, nor were the wing struts. The only identification was a framed placard proclaiming it to be a captured German aeroplane and that it was a gift of the French government. “I remember the colors and markings very well. The fuselage was natural varnished wood, blending to a yellow stabilizer with black diagonal stripes. I could not tell if this pattern was repeated on the top side because the dust was too thick to see through when I was up on the ladder. Whether the darker shade on top of the fuselage was paint or accumulated grime, I don’t know. 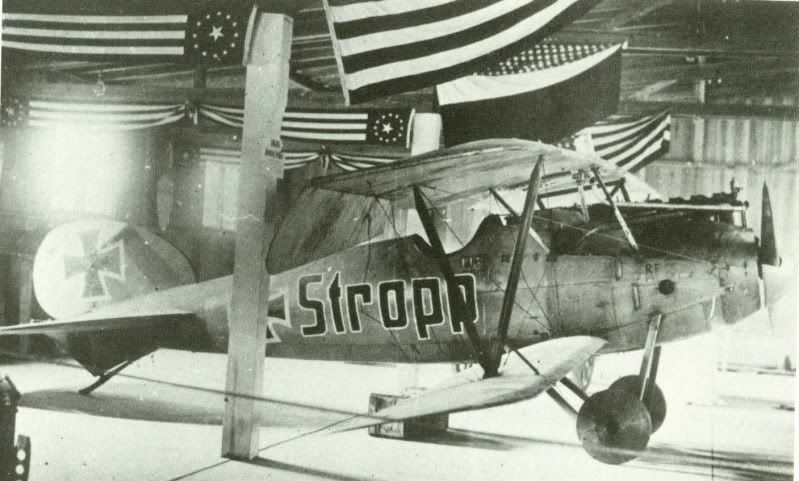 The word “STROPP” in lower-case German letters, black with a white border, appeared on one side of the fuselage; and if I recall, the word “SCHENCK” was on the other side (sic). White-bordered Formée Crosses were on the fuselage and part of one was on each fin. “I never did see the coloring on the top of the upper wing, but the bottom side was painted a shiny, dark grey; obvious (even as a kid) as a restoration. The lower wing was covered with a lozenge camouflage fabric. I gave up trying to trace that pattern by holding tracing paper up against the bottom surface. The bottom side of the wing carried straight sided open-end crosses painted over the Formée type. 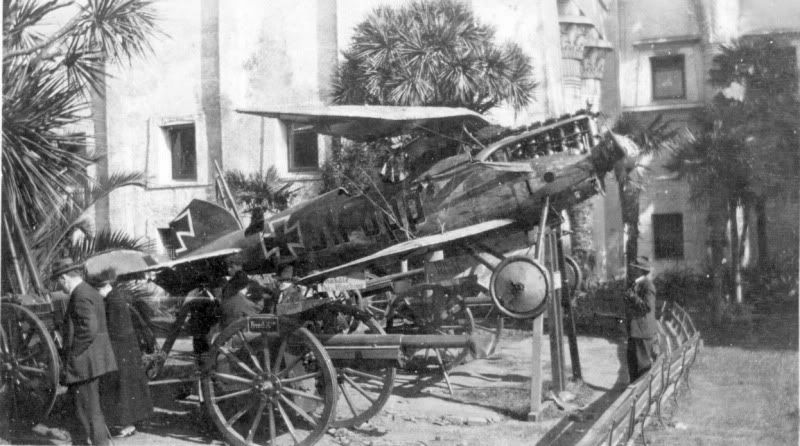 Since it wasn’t logical to find such a mixing of national markings on a combat type, I concluded much later that this particular Albatros was actually made up of parts of two different machines captured at different times. “Sometime in the middle 1930’s, the WPA did a restoration job on the airplane, in spite of recent reports to the contrary. By this time I was considerably more savvy on the subject of WWI airplanes and found plenty to scream about. The hole behind the cockpit was neatly patched, so now we will never know whether it was actually a second cockpit, or not. I didn’t look into it in the earlier “ladder” days for evidence of a seat or other signs of occupancy. New dummy struts were made, of wood instead of steel tubing, and very fat and out of proportion. Worse, a fourth center section strut was added to each side. Rudder and ailerons were still off, I could never get close enough to check other details as the “War Room” was always closed or alterations during my rare post-restoration visits, and I had to peer through locked grills from an adjacent room. “When the “War Room” was finally re-opened, it had been so altered that the ceiling was no longer high enough to hang the bird safely out of reach. With the grubby paws of little monsters getting at it, the museum retired it from storage, where it was when last I came to see it around 1940…Colonel Kimbrough S. Brown reports seeing it in the Smithsonian’s warehouse and that the rudder and ailerons are installed with it.” __________________________________________________ ___________ In Volume 5 No. 1 of Cross & Cockade, Volume 5 No.1, 1964, the journal published a letter from one Frank J. Macintosh of San Francisco, who also supplied the only known photo of the Albatros hanging from the ceiling of the DeYoung Museum. Macintosh wrote: “My enthusiasm for the Journal compels me to take umbrage with the article by Peter Bowers as he, relying on childhood memories, chose to describe a particular aircraft with which I am better acquainted. “The Albatros D.Va in the DeYoung Museum (San Francisco) was original, and I can assure you that no second seat was evident. There was a hole prior to 1936, underneath and behind the cockpit cause by the curious and/or looters. “The word, or name, ‘Stropp’ appeared on both sides of the fuselage. Only the right aileron was missing. The rudder was looted crudely, being sawed off, leaving the rudder post attached. All metal cowlings were gone; also missing were the shock-cords and axle fairing. “The renovation done in 1936 amounted mainly to the struts, as mentioned by Bowers, the basketball-sized hole underneath being patched with fabric, and some plywood being applied around the nose. As for coloring; the wings were as Pete described, the fuselage all-varnish with only the ‘Stropp’ business on the sides. The stabilizer-elevator had the diagonal black-yellow stripes which originated on top, with one vertical stripe on the fin which obliterated the serial number. "I last saw this aircraft in October 1943, and sat in the cockpit. Little did I realize it was to be sold at public auction for $500 several years later." "Here's the other photo, taken at the same location as the previous photo. This was taken sometime (early?) during the machine's tour across the country on the "Victory Loan Special" train. It was in remarkably good shape at this time. Here's a photo of the "Victory Loan Special". I wish I knew where this was taken." "Nice connection, Tim....but I don't think so. Yes, I know there were similar trophy/loan tours throughout Canada (I've done some studying on that topic with our Canadian member Edward Soye), but nearly all of the available material on "Stropp" has it only traveling through the USA. Of course, I could be wrong. 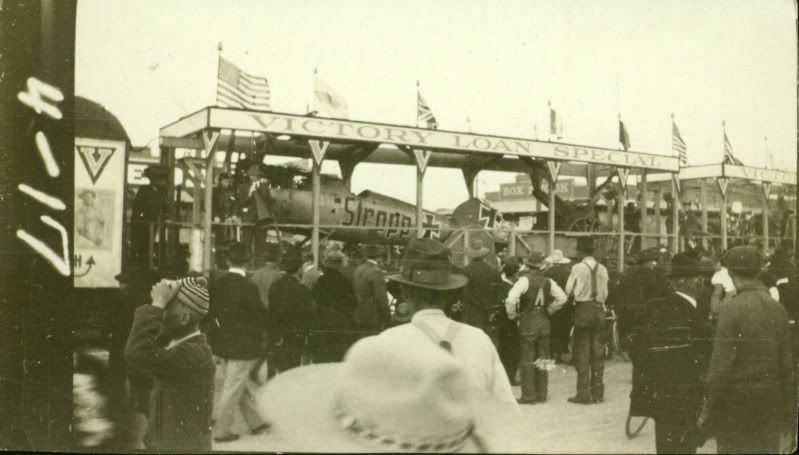 There is another photo of the "Victory Loan Special" in Mesa, Arizona. We also have some evidence that it may have gone through Waco Texas, and some of the associated trophies were in Chicago for a time. We know that STROPP wound up in San Francisco. Here's a close-up of the cockpit in some unknown location. Here 'tis in Golden Gate Park, San Francisco. I think it went directly to the DeYoung Museum after this. It was in pretty bad shape. Obviously, the sign "Must Not Handle" had been ignored - though I wouldn't want to mess with the lady in the hat! You can see the damage to the top and bottom of the fuselage in these shots." "Here's one final view in Golden gate Park, SF. Pretty sad." GVW continues. "It's my belief that the fuselage and tail of "Stropp" do not match the wings that were with the airplane when it arrived at the Smithsonian, in pretty bad condition. The aircraft was, IMHO, cobbled together with wings from at least two (perhaps three) different Albatros D.Va'aircraft - probably before the machine ever left France. 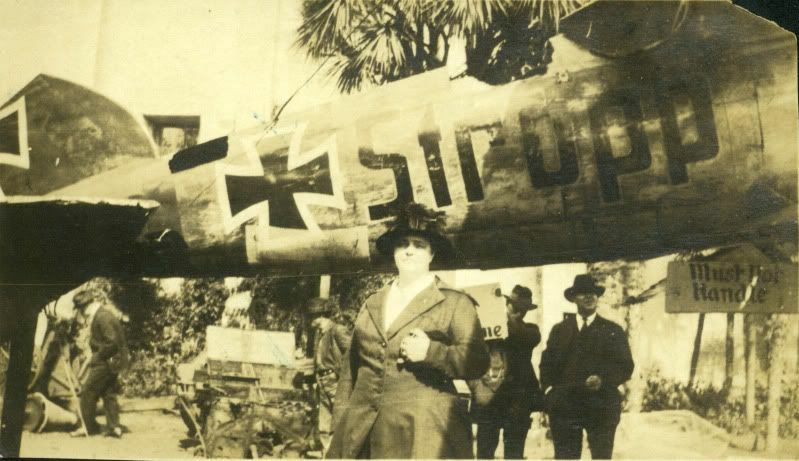 The location of the Iron Crosses on the upper wing identify that component as having come from an O.A.W.-built D.Va, while the fuselage and tail are obviously Albatros (Johannisthal) built. The Balkenkreuz insignia on the lower wings that were with the airframe do not match those on the upper wing, and some of the wing components were covered in five-color printed fabric while others were painted in green and mauve, etc. When Bob Mikesh and the Smithsonian restored the aircraft, they (incorrectly, IMHO) chose to cover the wings with lozenge fabric because it looked "better", I guess. Analysis of fabric samples from the original tailplane show that beneath the yellow and dark green stripes, the original fabric was painted in mauve and green above and pale blue below. This comes from analysis of fabric samples supplied by Frank Garove to Alan D. Toelle (who did the analysis). Therefore, I believe that all the fabric-covered surfaces were probably in green/mauve and pale blue painted finish when this machine left the factory." Here are a few references just on "Stropp": 1. Cross & Cockade USA Vol. 4 #2, Pp.195-7 1963. 2. Cross & Cockade USA Vol. 5 #1, Pp83-4 1964. 3. Cross & Cockade USA Vol.12 #2, p.190 1971. 4. Cross & Ccokade USA Vol.23 #3, Pp.273 -281 1982. 5. WWI Aero (? )Stropp a Mystery Solved? (drafted previous to 1986.) 6. Cross & Cockade Int. Vol.26 #3, Pp.133-130, Esp p.118 1995. 7. Albatros D.Va-German Fighter of WWI by Mikesh, Smithsonian Inst.Press,1980.